I cooked some blackened salmon in a cast iron skillet on the bbq grill. After the salmon was cooked and removed, I rolled the grilled corn in the remaining butter. The skillet was so hot it browned the corn in the butter. Making an unusually tasty dish. Remove the corn husks and silk. Soak the ears in salt water if you like. 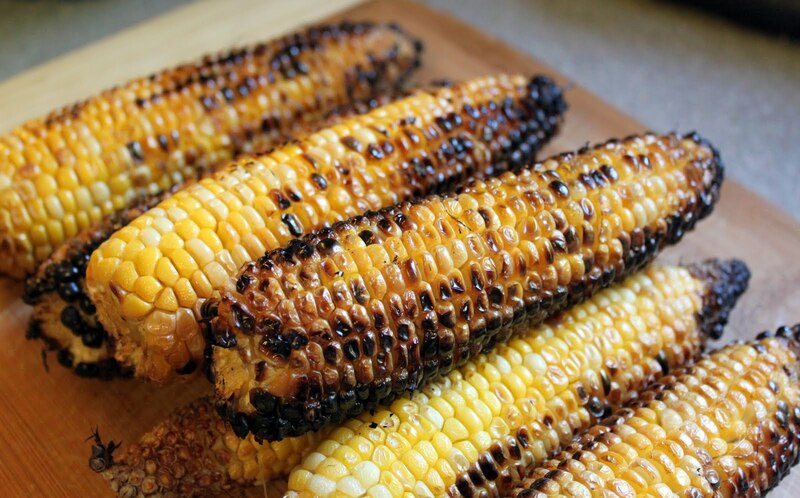 Place the corn on a pre-heated bbq grill, over medium heat and close the lid. I had the corn cooking side by side with the salmon. Rotate the corn when you flip the burgers, steaks, poultry, fish, etc. After removing the main course from the cast iron skillet, put the ears in, one at a time, and roll around in the remaining butter. Put them back on the grill and lower the flame as much as possible. Elotes, traditional Mexican snack food, are a grilled or simmered ear of corn, rolled in mayonnaise, a sprinkle cotija cheese, lime juice and chile powder. Variations are endless and will not be considered here. I used lemon juice, and smoked paprika. Lastly, some use the herb epazote with corn. It's somewhat traditional.